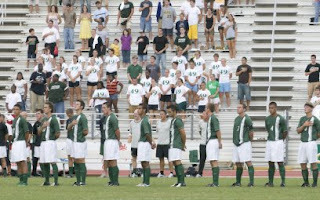 The Charlotte 49ers men's soccer team has released its 2009 schedule. The season begins with two exhibition games in August. Charlotte hosts Gardner-Webb on Sunday, Aug. 23. Then, the 49ers host their annual Alumni game on Saturday on Aug. 29. Charlotte kicks off the regular-season at rival South Carolina on Sept. 1. Then, the 49ers remain on the road with a game at Elon on Sept. 4 and play at Clemson on Sept. 9. Charlotte faces Campbell in its home opener on Sept. 12. Then, the 49ers look to capture their second straight Charlotte/Nike Invitational title when they welcome Appalachian State, Cal-State Bakersfield and Winthrop to Transamerica Field. The 49ers play Cal State Bakersfield on Sept. and Winthrop on Sept. 20. Charlotte concludes the month with games at UNC Greensboro on Sept. 26 and at Wake Forest on Sept. 29. In October, Charlotte plays at Furman on Oct. 3, host George Washington on Oct. 9 and Richmond on Oct. 11. Charlotte travels to Saint Louis on Oct. 17, hosts La Salle on Oct. 23 and Fordham on Oct. 25. The 49ers conclude the month with a road game Oct. 30 at Dayton. In November, Charlotte plays at Xavier on Nov. 1, at Saint Jopseph's on Nov. 6 and at Temple on Nov. 8. The Atlantic 10 tournament is Nov. 12-15 at Rhode Island.